Mushrooms and fungi have, for the most part, disappeared by this time of year. It’s possible to still find the tough bracket fungi on the sides of stumps and logs, but the tender stuff has all withered with the cold weather. So I was a little surprised to discover a small patch of soft fungi at the side of our driveway when I walked down to check the mail last week. They were on their way out, a few of them already collapsed, but still in better shape than I might have expected for the time of year. I recognized them immediately as members of the puffball family by the round shape with pores at the top. 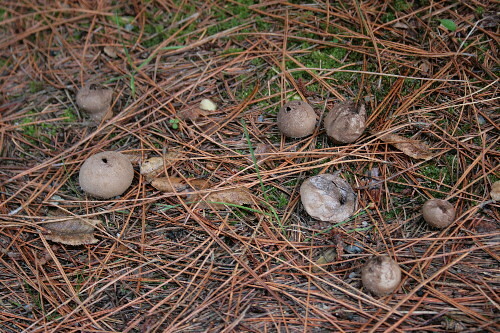 Like most mushrooms, the spores of puffballs are wind-borne. Most fungi rely on gravity to release them, though. 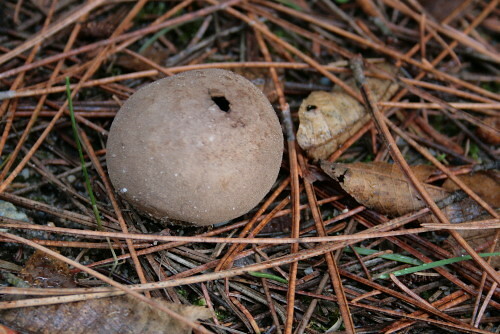 Puffballs have the unique strategy of containing the spores in a dusty mass inside a thin skin; when raindrops strike the shell, the impact causes a puff of spores to be released from the pore. I tried very hard to get a photo showing one of them puffing, but they were past their prime puff-period, and all I got were many photos of my finger indenting the side. I think these are Lycoperdon pusillum (which Mushrooms of Northeast North America by George Barron gives no common name for, but which the Peterson Field Guide to Mushrooms calls Mini Puffball), a widespread and relatively common species that fruits on the ground (some species of smaller puffballs fruit on logs, which rules them out; others have rough skins and these are smooth). When new, L. pusillum would be chalky white, but as they age they fade to tan and then to brown, and these are clearly older specimens. It’s interesting that they’re under our pines and surrounded like pine needles; though the guides I have don’t mention that, several photos I found online for the species also showed similar conditions. The species fruits from spring straight through fall, but I’m pretty sure I don’t remember seeing them back in the summer, so I wonder how each one decides when to pop up. The books say they’re edible, but lack much taste; these ones are probably past their best, anyway. I’ve come across these little guys often enough, but can’t recall seeing them in their fresh, white stage. Maybe it’s because they’re more visible once the grass dies down…or because their phase of puffy playtoy makes them much more memorable? It’s strange that I missed the white stage, too, Lavenderbay, especially given that they were growing right beside the driveway. I wonder if maybe they need certain conditions for white? Or maybe the white washes off with a rain and we just missed the pre-rain stage?